Home News & commentaries What types of energy does China finance with its development aid? China has been steadily intensifying its economic and strategic relations with developing countries in recent years. Through deepening trade ties, large-scale infrastructure financing and its ambitious vision to create ‘seamless connectivity’ through three main infrastructure sectors (energy, transport and information and communications technology) across continents through its Belt and Road Initiative, China has become an important ‘donor’ to developing countries. The establishment of its own development cooperation agency earlier in 2018 underlines China’s growing confidence as a donor as well as its intent to expand and streamline its aid programmes. Regarding China’s foreign energy investments, it is often highlighted that China has provided more than US$40 billion in overseas financing for coal-fired power stations since 2000, and that 11 of the world’s biggest 20 developers of coal plants are Chinese. However, this is only part of the story. In fact, China is investing a substantial amount of money in low-carbon energy generation in countries with developing and transitioning economies. The analyses in this commentary reveal the kinds of energy projects that China has funded, their size and their geographic distribution. The overseas lending from China’s two main policy banks is substantial and amounted to US$ 675 billion at the end of 2016, more than twice the size of loans from the World Bank. Estimates show that China could invest as much as US$500 billion in about 60 countries over the next four years, and the Belt and Road Initiative could mobilise up to US$1 trillion of outbound state financing from the Chinese government over the next eight years. Given the enormous scale of the investments and their impacts, it is important to understand more about China’s current lending portfolio for energy projects. Most international observers remain woefully ignorant about the precise nature and scale of China’s investments overseas. Despite, and potentially partly due to, this lack of knowledge, China’s aid flows have triggered widely shared scepticism and suspicion in Western countries. The New York Times coined the term ‘rogue donor’ for China back in 2007. More recently, Europe particularly has been eyeing China’s infrastructure ambitions under its Belt and Road Initiative with increasing concern, some of it due to tension over whether European countries could be disadvantaged by Chinese companies in developing countries. Some of this tension might have been driven by the lack of available data on China’s aid funding. China does not yet disclose comprehensive information about its overseas development finance. It has opted out of international reporting systems such as the OECD’s Creditor Reporting System or the International Aid Transparency Initiative. In addition, the scope of China’s ‘aid’ remains broad and vague compared to the definition used by the OECD’s Official Development Assistance measurement. A White Paper on China’s Foreign Aid, released in 2014 by China’s State Council Information Office, defines three types of financial resources for aid: grants, interest-free loans and concessional loans. In addition, some of China’s loans are accompanied by debt-servicing conditions, such as access to resources or contracts (e.g. oil-backed loans), which distinguishes China’s aid from that of traditional Western donors. A detailed breakdown of China’s aid flows is therefore unavailable to international analysts. They must instead rely on other data sources to understand where China’s money goes. This analysis uses the most comprehensive source of project-level information on Chinese official finance and official development finance to date. The analysis described here tracks and allocates this project-level information to the specific energy sources, and is the first of its kind. It captures more than 300 energy projects funded by the Chinese government (worth almost US$200 billion) that were officially committed, are in implementation, or completed in 140 countries and territories across five regions of the world (Africa, the Middle East, Asia and the Pacific, Latin America and the Caribbean, and Central and Eastern Europe) between 2000 and 2014. The projects included in these data are those classified according to the OECD Creditor Reporting System sector code for energy (category 230) and include energy generation, distribution and efficiency. 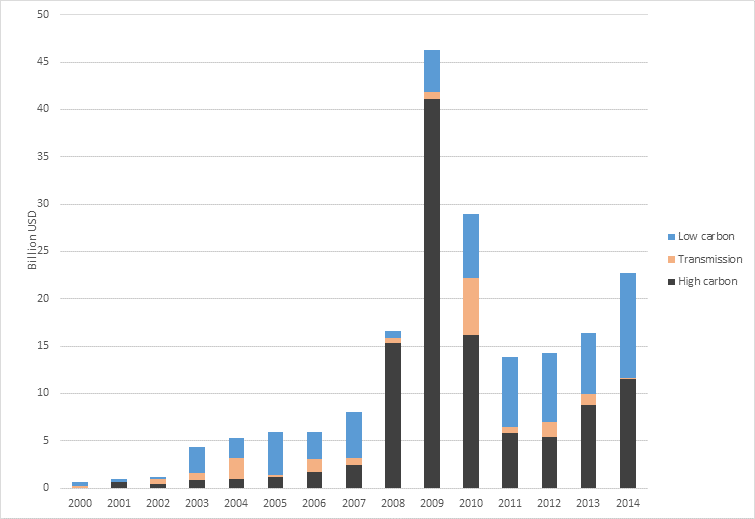 The analysis shows that most of the projects the Chinese government has funded to date involve the construction of grid connections (transmission) and hydro generation (see following graph). 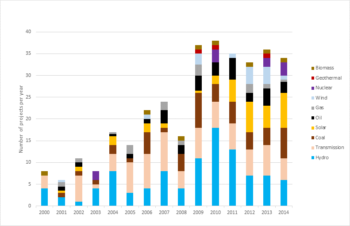 It also reveals that the number of wind and solar projects has been steadily increasing since 2009. In total, low-carbon energy generation projects (as defined below) are almost twice as numerous as high-carbon generation projects. However, if we look at the number of US dollars used to fund those projects the picture changes. The financing can be classified by value of these projects, split into low-carbon generation, high-carbon generation and transmission to show the dimensions more clearly. 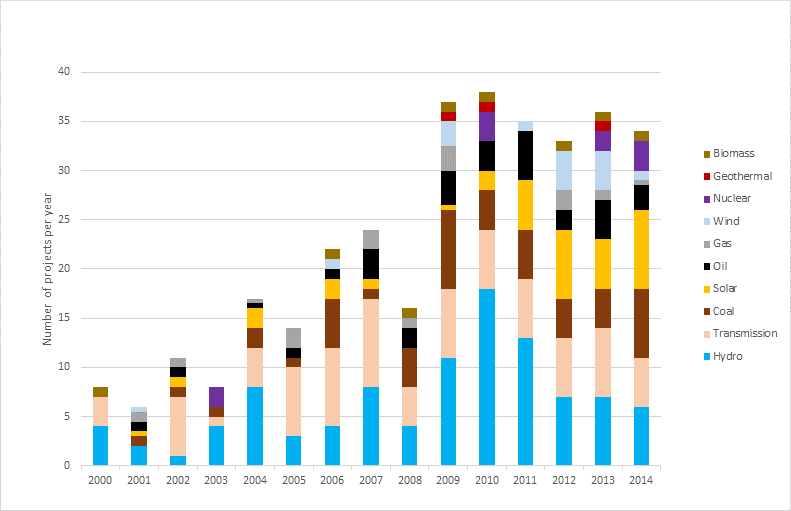 This shows that annual energy investments have been highest in low-carbon generation in many of the years since 2000. The spike in the share of high-carbon projects in 2009 is mostly due to a US$25 billion loan by the China Development Bank to Russian energy companies Rosneft and Transneft for a 20-year oil supply contract (with attractive preferential interest rates in exchange). If we look at the total investments by dollar value, it shows that Chinese investments in coal, oil and gas still outweigh investments in renewable energy generation. In fact, between 2000 and 2014, China has spent around US$100 billion financing high-carbon energy investments and around US$60 billion for low-carbon, of which hydropower makes up the largest chunk. Limiting the analysis to the 22 countries that received at least US$2 billion in total since 2000 shows that low-carbon and high-carbon projects tend to be concentrated in different countries (see map). However, many of these countries do not form part of the current list of countries along the Belt and Road (e.g. Brazil, Ecuador, Angola, Nigeria). China invests large sums of money in Russian, Ecuadorian, Brazilian, Venezuelan and Angolan oil projects. 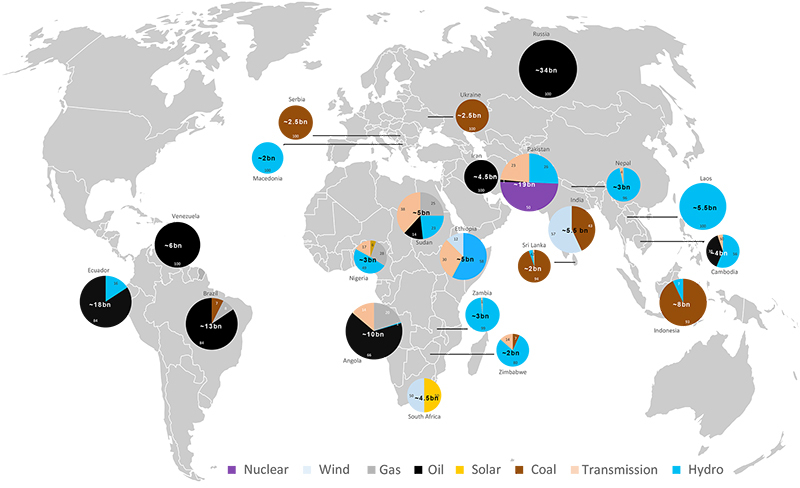 Its investments in Eastern Europe are mostly in coal-fired power plants whereas its energy investments in South East Asia are mostly a mix of coal and hydro. Among the top-22 financial recipients of aid, Pakistan is the only country that receives investments in nuclear energy. This analysis considers only the energy projects that the Chinese government has invested in so far. The World Bank estimates that there will need to be an investment of around US$3 trillion worldwide in the electricity sector by 2040, mostly in developing and emerging market countries. Keeping pace with the economic and demographic changes plus meeting the Sustainable Development Goals will require infrastructure spending as a proportion of global GDP to grow from the current level of 3% to 3.7% per year by 2040. China can, therefore, fill a gap in much needed infrastructure investments with its development aid. Although large opportunities still exist to align these infrastructure projects with the climate and energy goals of both China and the recipient countries, China is nevertheless filling a role that has been left empty by many of the multilateral development banks and bilateral aid agencies. The eight largest multilateral development banks together provided about US$340 billion of infrastructure financing between 2004 and 2013, i.e. roughly the same size as China’s investments. China provided more than US$360 billion for energy generation and supply, transport and storage in developing countries during the period 2001 to 2014. In light of the large infrastructure investments that are still needed in developing countries in the future, Western and Chinese donors can join forces. If China were to increase transparency and disclosure of their investments, the opportunities to learn from them could help improve international understanding of the impact infrastructure investments have in developing countries. With a more open sharing of data there could also be opportunities and willingness to explore collaboration between the West and China. Isabella Neuweg is a policy analyst at the Grantham Research Institute on Climate Change and the Environment. With thanks to Ara Jo, Tobias Kruse and James Rising for their help visualising the data. The views expressed in this commentary are those of the author and not necessarily those of the Grantham Research Institute.